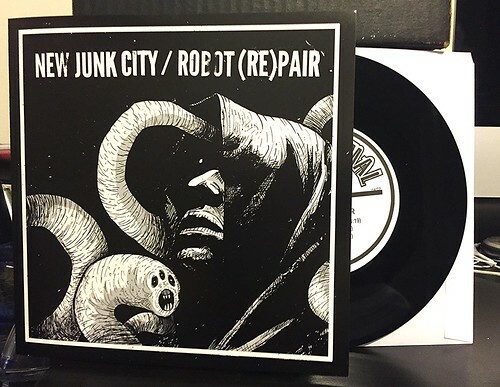 I Buy Way Too Many Records Dot Com: New Junk City / Rebot (Re)pair - Split 7"
New Junk City / Rebot (Re)pair - Split 7"
One of the interesting things about the recent uptick in records being sent to me to review is that it is exposing me to new bands that aren't on my radar. Granted, that's not always for the best as there certainly some stinkers that get sent my way. That being said, the few good ones that manage to sneak through are more than enough reward to sift through sthe sewage. Case in point is New Junk City from this 7". I don't really have any idea where these guys came from (OK, their Bandcamp page says they are from Atlanta, but you know what I mean). I kind of can't fathom that I would have stumbled across this 7" on my own. Not for any particular reason, I'm just not really sure where it would have popped up for me given my fairly narrow use of the internet. Anyway, these two New Junk City songs are great. On "Everything Good," lightly distorted guitar riffs in the verse give way to a chorus that crashes through the song. The vocals are forceful, but not screamed and most of all it's supremely catchy. "Wasting" may even be better with its bouncy chord progressions. It's the best kind of punked up pop, without falling into the trappings of generic pop punk. Robot (Re)pair doesn't quite hit the same kind of highs that New Junk City hits. The recording of these three songs is a little flat, which probably doesn't help things. The first two songs are both about a minute long and they feel like throwaways. By the third song, "Weird World," they slow things down a bit and take their time. The results are better and it's a reasonably catchy song, though I liked it more before I read the lyric sheet. None of the three songs are bad, but they are completely overshadowed by how great these New Junk City songs are. Heavy Times - Black Sunglasses 7"
Satellite Go - Kate 7"